This entry was posted in gear, news, reviews on April 22, 2009 by Theaux Le Gardeur. I spent every day the last week and a half on the Gunpowder River, guiding and fishing different stretches at different times of the day. Midges and blackflies are hatching in good numbers and the blackflies can be seen “skimming” along the surface. They look like a miniscule housefly with a short, thick body versus the long, thin bodies on midges. Trout sipping in the flat water areas are usually eating these bugs and flies in the 20-24 range will work. Hendricksons are starting to emerge late in the morning through 2-3 pm, and many are a tannish-olive, although they darken up to a deep reddish brown. 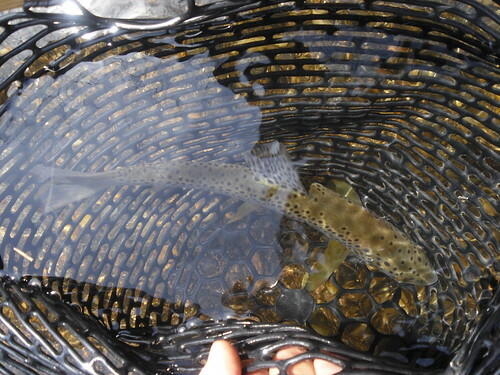 The brown trout are eating a variety of emerger, nymph and soft hackle patterns during the day, especially during these higher flows. Dry fly enthusiasts should try prospecting with hendricksons midday, as the majority of anglers catching fish on dries over rising trout started before 9 a.m. or after 5 p.m. Although, on a recent guide trip the client rose around fifteen fish during the brightest hours of the day in less than 100 feet of river. Reports from customers include good dry fly fishing, yet the fish are not seen rising, but are rising to eat a properly presented fly. Midges are also hatching heavy toward dark, and while the sipping fish are only active the final hour of the day, they are eagerly feeding on the surface. Hendrickson spinners have been seen toward dark, and in good numbers bring fish to the surface. The rain has helped bring out some decent hatches, and raise water temps and levels with warm spillover. The rain predicted through this week may continue to blow out the Pennsylvania and Western Maryland rivers (Savage River currently spilling over at 345 Cfs and the North Branch at 1, 135 Cfs). The Gunpowder currently spilling over at 197 Cfs remains fishable with dries over 200 Cfs, and many die hard nymph and streamer fishermen target the usually wary, big browns in flows up to 300 Cfs. 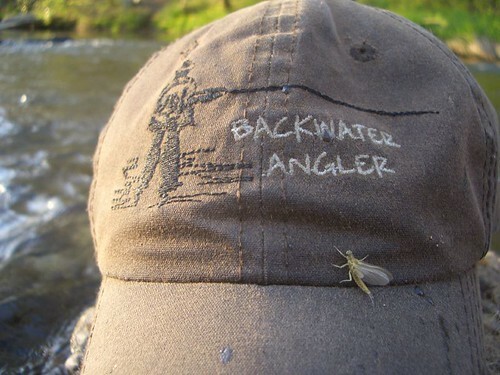 I included a short video of some blackflies and a close look at a Hendrickson mayfly along the Gunpowder. This entry was posted in news on April 21, 2009 by Jason du Pont. 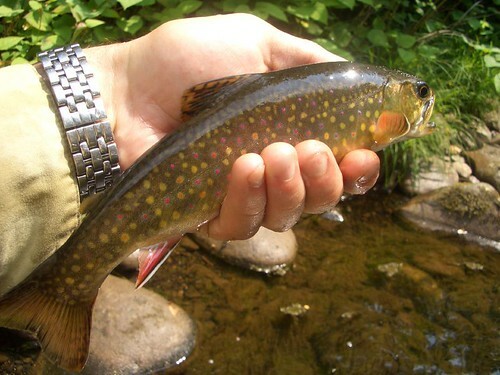 Western Maryland offers fly fishermen a chance at everything from large trout in big rivers to native Brook trout in tiny mountain streams. The region is rugged, wild and fishing pressure can be light, but challenging. Backwater Angler guides have offered trips on the Savage River, North Branch of the Potomac River and small mountain streams for years. In the past we offered overnight packages including lodging, meals and a full day guided fishing, but will now offer only six or four hour guided wade trips based on the overwhelming amount of requests from anglers. The North Branch of the Potomac is known as Maryland’s largest trout river with notoriously tough wading conditions, and is home to big stocked rainbows, cutthroats and brown trout. 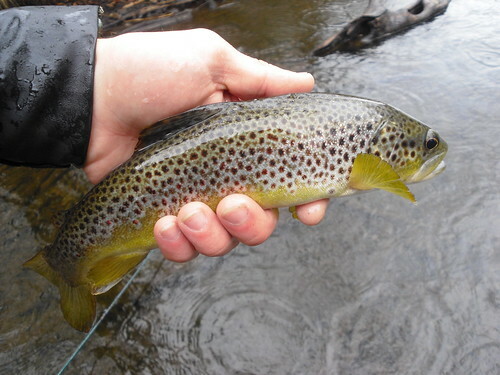 The Lower Savage River is known for great hatch fishing, rough pocket water and all wild trout. 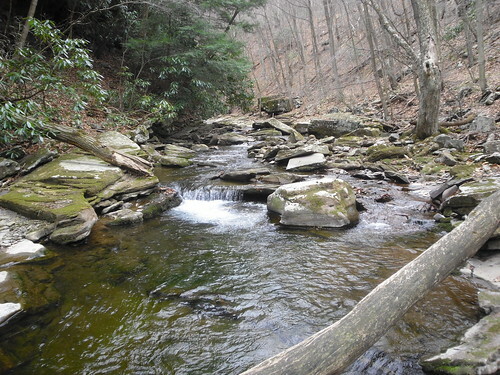 The Upper Savage River is home to a mix of stocked trout and wild brook trout. 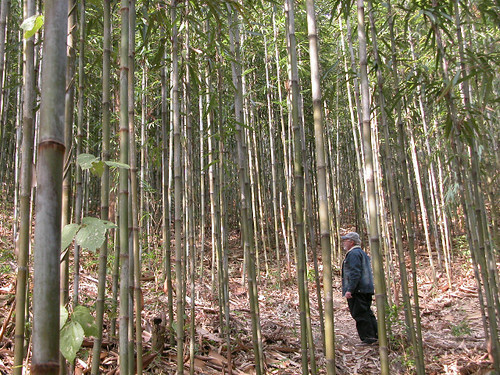 These areas are only minutes apart, yet each stretch has their own appeal. 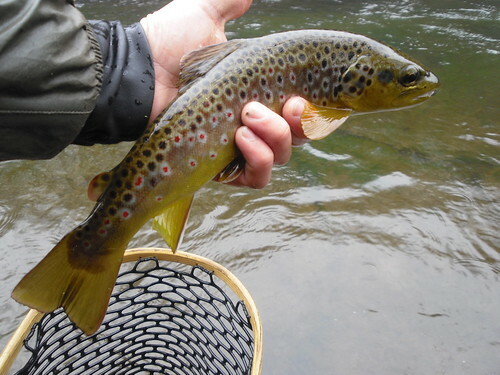 The first available dates for a guide trip in Western Maryland are April 20th, 21st, 22nd and 23rd. Through Spring and Summer we will continue to post upcoming available dates BWA guides will be on these rivers. Guided trips can also be booked by calling or emailing Backwater Angler for guide availability, and lodging recommendations. This entry was posted in news on April 11, 2009 by Jason du Pont. I fished upstream of Masemore to the bridge. I only saw maybe a few rising fish, and a few midges. Windy and cloudy until mid afternoon. Caught three browns on streamers. Thanks for the help on Monday. I fished from the upper falls lot to the dam from about 3:00-6:30. There was not much of a hatch and very few rising fish, however they were very eager to take a zebra midge. 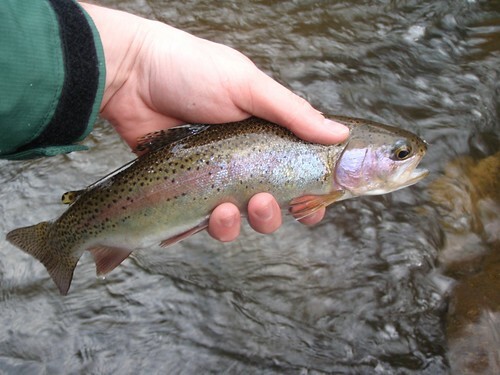 I managed to bring about ten trout to hand, the best fish being a beautiful 12 inch rainbow. I attached a few pics. Thanks again. From April 2004, Ants Anyone? This entry was posted in fishing report on April 8, 2009 by Theaux Le Gardeur. Please join us for a flyfishing school. On Sunday, May 3, a Backwater Angler Guide will be teaching a fly fishing school that is ideal for beginners. If you’re planning on flyfishing Maryland, or anywhere else for that matter, this course is a great introduction to the sport. The school covers knots, casting, gear, fly selection and an hour of on-stream instruction. Schools are held in a meadow overlooking the Gunpowder river by a Maryland state licensed and insured fishing guide. Class is held from 11:00 AM till 2:00 PM. Cost is $100 per person and includes the use of gear. A Maryland Non-tidal fishing license and trout stamp is required and may be purchased prior to the class with check or cash at the shop. Class size is limited to 4 and pre-registration is required. Please give us a call at 410-357-9557 or drop us a line at info@backwaterangler.com to pre-register. This entry was posted in events on April 8, 2009 by Theaux Le Gardeur. Please join us for a flyfishing school. On Sunday, April 26, a Backwater Angler Guide will be teaching a fly fishing school that is ideal for beginners. If you’re planning on flyfishing Maryland, or anywhere else for that matter, this course is a great introduction to the sport. The school covers knots, casting, gear, fly selection and an hour of on-stream instruction. Schools are held in a meadow overlooking the Gunpowder river by a Maryland state licensed and insured fishing guide. Class is held from 11:00 AM till 2:00 PM. Cost is $100 per person and includes the use of gear. A Maryland Non-tidal fishing license and trout stamp is required and may be purchased prior to the class with check or cash at the shop. Class size is limited to 4 and pre-registration is required. Please give us a call at 410-357-9557 or drop us a line at info@backwaterangler.com to pre-register. The Gunpowder River has risen with recent rains, and is dropping, but more rain is forecast before the weekend. The added spillover and warm air temps have improved the fishing and jump started the hatches. This nice brown pictured above was caught on a size 24 blackfly dry, as many fish keyed into the tiny bugs. Stoneflies, midges and blackflies hatching in good numbers had the fish sipping small flies throughout miles of river on Monday. The dry fly action can be sporadic, or fish feeding intensely for brief periods of time in the middle of the day. 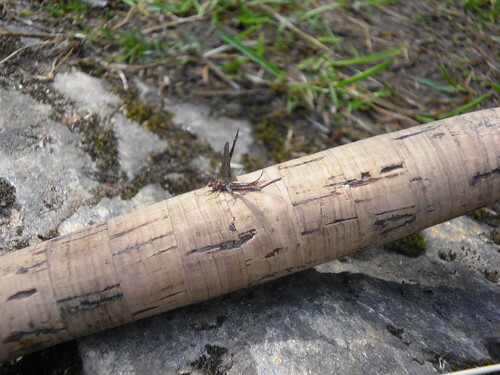 Expect to fish over selectively midging trout in the flat water areas, twitching stoneflies near woody debris and swinging or dead drifting nymphs in riffles. I expected to see the occasional Blue Wing Olive, but was surprised to see six Hendrickson mayflies, weeks early. I took this pic before catching a few browns on a small pheasant tail nymph in the same riffle. This entry was posted in fishing report on April 1, 2009 by Jason du Pont. Thanks to Mark Sturtevant who writes a nice column in the York Daily Record, Sunday News for the mention in the article titled; A Fine but Fleeting Taste of Spring. I lingered at the local fly shop, the Backwater Angler, talking with owner Theaux Le Gardeur about recent fishing and the state of the river. The shop has a new location and is tastefully laid out. Sunshine through the open door pulled me thence and on to the river. This entry was posted in news on April 1, 2009 by Theaux Le Gardeur. The forecast last week predicted mild temps and scattered rain showers for the western Maryland region, so I decided to fish the Savage for a few days midweek. The whole river was empty, and I saw no anglers until my last day on Friday. Water temps hovered in the 42 degree, and flows stayed at 60 Cfs. The fishing improved during the warm parts of the day, and rising fish could be found in numerous pools along the river. Blue wing olives sized 18-24 were bringing the fish up sporadically, so the dry fly action was a waiting game in some pools. Neil, a customer of the shop, made the trip for a few days and had some exciting fishing in these pools. After catching a few eleven inch browns on dries the first day, I spent the following three days nymphing small nymphs, in the fast water chutes and runs. By weeks end I managed over twenty browns and brookies, the larger browns reaching fourteen inches. I spotted quite a few larger browns in the 16-19+ range on the bottom or even occasionally rising, but only had one take and missed the fish.The fishing at times was tough with the cold temps, so I spent a few productive mornings on some brookie streams. The region is warming up and the next few months should provide some great hatches and actively feeding fish. I filmed one of the larger Olive mayflies, and my first feisty Savage brown on a dry this year. This entry was posted in fishing report, video on April 1, 2009 by Jason du Pont. Fly Fishing Maryland? Please join us for an intermediate Fly Tying Class on Saturday, April 11, 2009 from 9:00 AM till 12:00 PM. The class focuses on Hendricksons and Blue Winged Olive mayfly patterns. Our very own Gunpowder river guides will be teaching this fun-filled lifecycle class. 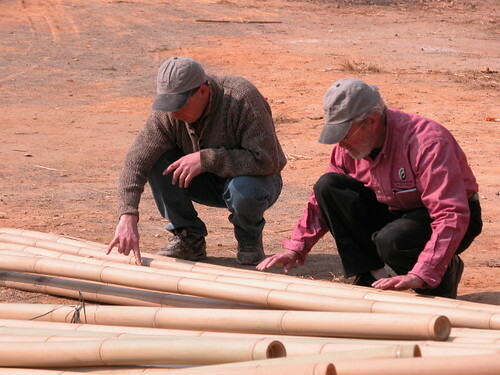 Cost of the class is $45 per person, and includes the use of materials. Please bring your own tools.The class is limited to six and pre-registration is required. Please give us a call at 410-329-6821 or drop us a line at info@backwaterangler.com to pre-register. This entry was posted in events on April 1, 2009 by Theaux Le Gardeur.